The best Las Vegas Haunted Houses list of scary locations to go to can be difficult to narrow down, as there are around 50 haunted houses in the city, some of which are open all year around. The best haunted house in Las Vegas, Nevada, has finally been settled, however, once and for all. It is Asylum — or, make that Hotel Fear. Then again, the best haunted house in Las Vegas just might be Fright Dome at Circus Circus, or Isolation, filled with crazy traps and crazier inhabitants. Or, possibly the best haunted house in Las Vegas is another one at Fright Dome, called Hotel Argento, based on the movie, The Collector. Both Asylum and Hotel Fear are listed in America’s Best. Also, both are rated as the number one attractions in Las Vegas, so they definitely are places where any fans of haunted houses will want to add to their lists of places to go. Both are open all year around, and Asylum Haunted House holds the record as being the longest running haunted house in Las Vegas. At the Asylum haunted house, the lunatics are in charge of the Asylum, in particular, inmate Mortimer Feoray. Good old Mort went a little bit crazy and is always on the look-out for new victims. According to Hauntworld.com, Asylum is a past Hauntworld Top 13 attraction. It is also among the places that are recommended by the Travel Channel as a “Top Thrill” destination. The themes of the Asylum haunted house and that of Hotel Fear are interlinked. Hotel Fear is a hotel where, like in the Eagles song, Hotel California, “You can check-out any time you like/But you can never leave!” The Undead are there, as well as guests to the locale, and they do not want any visitors to leave…alive. With Hotel Fear and Asylum ranked so highly on the lists of great Las Vegas haunted houses, they must be the two best ones in Las Vegas, right? They are definitely both very scary places, but the six haunted houses that the Fright Dome has to offer give them a run for their money. They each, individually, could qualify as some of the best Las Vegas haunted houses, but taken together, well…they make Fright Dome another attraction which all visitors to Las Vegas who love haunted houses need to check out! Fright Dome was created by Jason Egan, and it contains six haunted houses and a new roller coaster, El Loco, within five fog-filled acres. There are 25 rides in all there, and three extreme scare zones. It is not a place recommended for children under 12. 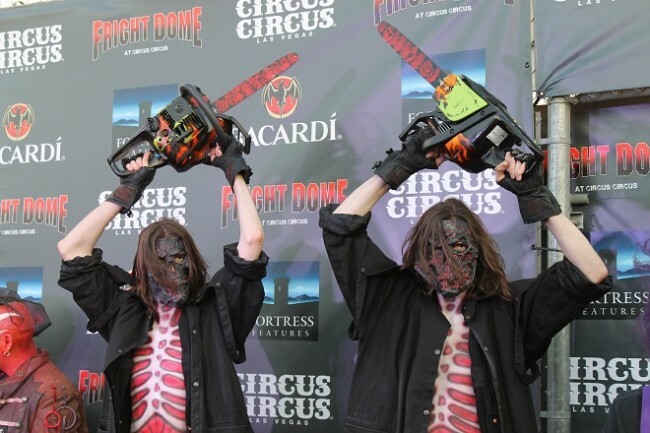 This year’s theme at the Fright Dome at Circus Circus Las Vegas is the movie The Texas Chainsaw Massacre. How can any person who loves haunted houses not enjoy one that incorporates chainsaw-wielding maniacs who terrorize anyone who dares to fork over their money to enter? Leatherface, straight from the movie, is there to attack guests. Then, there is the haunted house at the Fright Dome dubbed “Isolation.” It is a haunted house for people who are not faint of heart, who are not afraid brave traps and the insane inhabitants of the attraction. It is one of the best Las Vegas haunted houses — ask anyone who has been there and has made it out alive. Also, this year marks the first one that the El Loco roller coaster is open, located under the darkness of the haunted attraction. El Loco has 6 drops, along with gravity-defying turns and over-the-edge twists. The hours the Fright Dome is open at this time of the year are 7 p.m. – midnight, through Oct. 31 on select nights. Hotel Argento is the newest of the Las Vegas haunted houses, and it is the latest one added to the five that were already at the Fright Dome. It is only available for guests who have purchased an upgraded fast pass. The Hotel Argento takes guest right into the heart of the Collector’s lair, but to have the privilege of entering this haunted house…a person must enter alone, separated from friends. Once inside, there are many traps to contend with, and the fact that anyone who enters it is fair game, to be hunted and possibly to become the next person added to the Collector’s ever-growing collection. Though it is new, Hotel Argento is already making a case for itself that it deserves to be called one of the best Las Vegas haunted houses. There are many, many more awesome Las Vegas haunted houses. Please comment below if a favorite one has been left out, or if the ones in this article are suitably scary enough. Las Vegas haunted houses are among the very best in America. Check them out this Halloween!